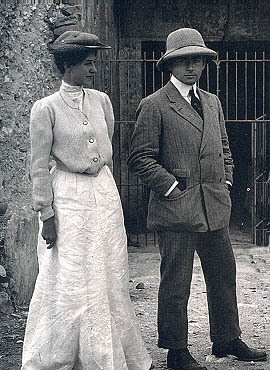 Arthur Edward Pearse Brome Weigall (1880–1934) was an English Egyptologist, stage designer, journalist and author whose works span the whole range from histories of Ancient Egypt through historical biographies, guide-books, popular novels, screenplays and lyrics. Arthur Weigall was born in the year in which his father, an army officer, died on the North West Frontier. As a young widow, his mother turned missionary in the inner-city slums of late-Victorian England. So Arthur Weigall went from an unconventional home life in Salford to Wellington College, a school with strong establishment and military connections. He started work as an apprentice clerk in the City of London, but a youthful fascination with genealogy led him to the pharaohs of Ancient Egypt and so into Egyptology. A mysterious patroness encouraged him to apply for New College, Oxford. This was a mistake (Egyptology was not yet studied at Oxford) so he went on to Leipzig, and on his return to England found work with Flinders Petrie, first at University College London and then at Abydos in Egypt. Life with Flinders Petrie was notoriously harsh, and after a while Arthur Weigall went to work for Friedrich Wilhelm von Bissing, a German Egyptologist. In early 1905 Howard Carter was staying with Arthur Weigall at Saqqara when after an incident with some French tourists, Howard Carter was forced to resign his post as Chief Inspector of Antiquities for Upper Egypt. Suddenly, at the age of 25, Arthur Weigall was appointed to replace Howard Carter at Luxor, responsible for protecting and managing the antiquities of a region that extended from Nag Hamadi to the border with Sudan.